Do you get frustrated when facing taller opponents? In this post I outline the tactical tools Sam-A used to defeat his taller opponent with a KO finish. I broke it down into 4 principals in which you can include in to your training. Petchyindee's birthday show, November 25, 2014, Lumphini Stadium. 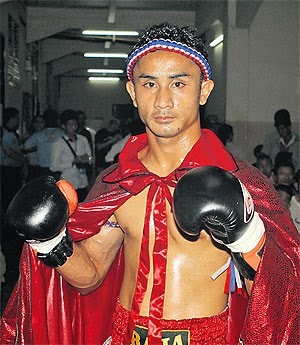 Sam-A GaiYangHaDao gym faced a taller opponent, Bangpleenoi 96Penang gym, for Thailand's Featherweight (126 lbs) Title. Mixed in with a few pawing jabs, you will notice that Sam-A uses the teep (more about teeps here) to Bangpleenoi's upper thigh/hip area. This serves a few purpose. Gauges opponent's reaction and response. Can make an opponent hesitate on attacking. Stop an opponent's forward movement. Since the shorter fighter is giving up range, it would be wise to lead with teeps and jabs to your opponents nearest target. Whether it's pawing jabs to the hands or teeps to thier leg. It's the most active way to figure out your range. 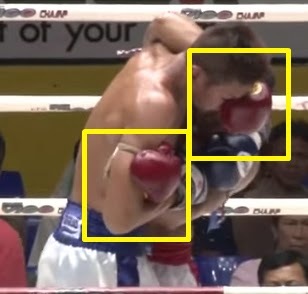 In many occasion Sam-A nullify Bangpleenoi's clinch by quickly aiming for inside collar control and restraining blue's arm (which prevents an opponent from elbowing and assist in turns/sweeps). Red also uses turns and sweeps to make blue's foundation rocky so as to not let blue get set in a dominate position. Inside arm control (prevents opponent from regaining better position and/or elbowing). Both arms aimed at the inside. 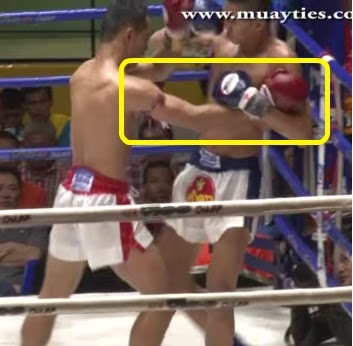 Right hand on opponents bicep in order to restrains his arm. Leg raised in a "Check" position is used in order to prevent/block opponent's knee strikes. Red shoots for inside control in the clinch but blue works to get inside. Sam-A controls the pocket; pawing jab to check the range then meets blue with a cross. As Bangpleenoi tries to regain his balance Sam-A charges him like Winnie The Pooh all over honey. Red finishes blue with an onslaught of knees, a head kick, uppercuts and some more knees. I hope you find these guide lines helpful for your training or next fight. 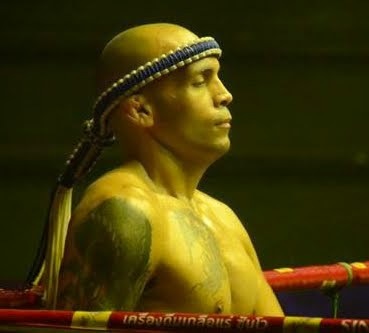 Here is the full fight video from Muay Ties Youtube channel.